The Real-Life Inspiration For The Super Friends’ Hall Of Justice Is Located In? The Sentence "Where You At?" Is An Example Of A? From 1973 to 1986, Super Friends, an animated series focused on a team of DC-universe super heroes including Batman, Robin, Wonder Woman, Superman, and Aquaman, ran as part of the ABC Saturday morning cartoon line-up. The activities of the heroes centered around their main base, the Hall of Justice, where each episode would open with the heroes responding to a call for help delivered by their massive supercomputer Trouble Alert. The Hall, in the context of the Super Friends series, is located in Metropolis, the fictional American city that serves as a backdrop for many DC-universe comics, cartoons, and movies. Although you can’t jump through the screen and visit Metropolis, you can pay a visit to the closest thing there is to a real life Hall of Justice. 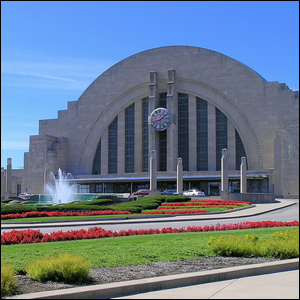 The super heroes’ home base was modeled off the enormous and beautiful Art Deco-style train station, Union Terminal, located in Cincinnati, OH. After the heyday of rail travel passed, the majority of the structure was converted into space for a museum, theaters, galleries, and a library. For those of you that want to see it by rail, however, book a ticket on Amtrak’s Cardinal service between Chicago and New York City to arrive at the station in golden age style. Image courtesy of Greg Hume.